* Or at least big tax increases. 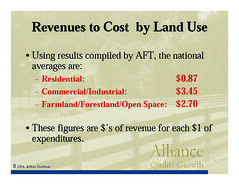 See The Economics of Growth, Sprawl and Land Use Decisions. Note and jobs, not just people: jobs so the people can work and afford the houses they live in. Development patterns have an impact on the cost of service delivery: sprawl is expensive to service. The same growth done more densely and contiguously saves both money, farmland, and provides environmental amenities. These figures are $dollars of revenue for each $1 of expenditures. He goes on to say which sorts of development work (dense and contiguous) and which don't (sprawl doesn't). Sociologists are finding that today more and more high skill workers are choosing where to live first, then finding jobs. Because businesses want high skill workers, they follow these workers to places with good quality of life. If you attract good workers, good jobs follow.